This is my first post, and unlike Boris, my perspective is from a humble home baker. I’ve been baking now for a few years and in spite of being a professional software engineer, I’ve managed to crack through the ‘bread ceiling’ and come up with some good and consistent results. This Christmas we (both Boris and my families) decided to visit the Tasmanian highlands for a couple of week’s holiday and I thought it would be a great idea to bring Steve along. Steve is my sourdough starter. Now you may be wondering why I’ve bothered to name my starter at all, let alone Steve. Firstly, a sourdough starter is a living culture of micro-organisms. It needs to be looked after and fed; and most importantly it brings you joy and good health. It’s all pretty much like having a pet cat (including the indifference). So giving it a name psychologically bonds me even more to my starter and ensures I give it the love and protection it deserves. 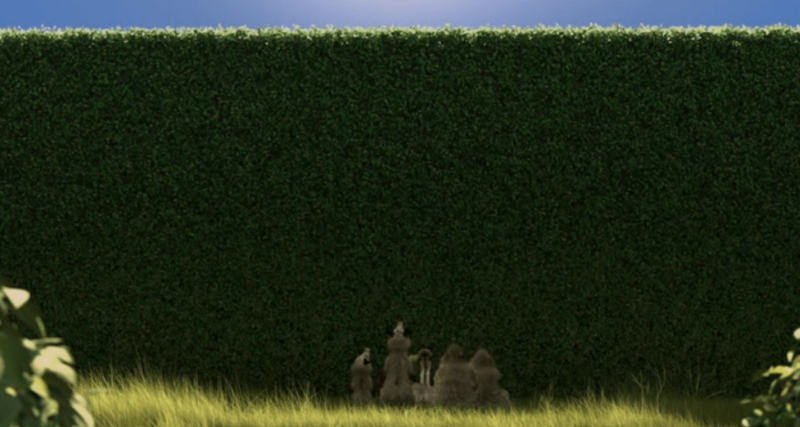 As for why I chose Steve – it’s a reference to the hedge in the kids animation film “Over the Hedge.” When Hammy shows the others the hedge for the first time… “I’d be a lot less afraid of it if I just knew what it was called.” says Gladys as they all cower under the hedge. “Steve!” says Hammy squirrel. “…yeah I wouldn’t be afraid of Steve…” and then Ozzie says “O great and powerful Steve! What do you want?” If you have the DVD then watch from about 10 minutes in, I found it quite amusing and I think its a great metaphor for how the novice sourdough baker seems to approach their starter. Anyway, that’s the crazy idea I got when I was having a coffee with my mates and it dawned on me that I really should give my starter a name: Steve! Frame from movie “Over the Hedge” as the characters see Steve for the first time. We had decided to drive from Sydney to Melbourne, take the ferry with our cars across Bass Strait to Devonport and then drive the hundred or so kilometers to Miena in the central highlands, where we had access to the Devonport Fly Fishing Club Lodge. Boris suggested that we could leave Steve (the starter) for Don (a fishing buddy of his), so before leaving home I increased Steve to double his size and left half at home and took the other half (son of Steve) with us. As it would take a couple of days to get to Miena, I made sure Steve was well fed and in the fridge till the last minute before we left. I kept him in the back of the car in an eski and when we reached Melbourne immediately put him in the fridge till the next morning. Again the next morning traveling in the back of the car on the ferry and straight in the fridge on arrival at the Lodge. It didn’t take long before it was time to make some bread. The Lodge had a reasonable kitchen oven, but of course no stone! You’ll know how important a stone is from Boris’ post Stone in a domestic oven, why? Fortunately, the fishing fraternity, and in particular the Tasmanian lot, are very resourceful and before we knew it Don and his mate Murray rocked up with a fine slab of stone he picked up by the shores of the Great Lake (Murray managed to split it nicely to get two pretty flat sheets, one for us and one for Don’s oven). It looked like a basalt or dolerite and was reasonably thin and flat, so an excellent candidate. If it was a sandstone I’d be reluctant to use it as that is generally too soft and prone to crack up from the sudden changes of temperature experienced in an oven. 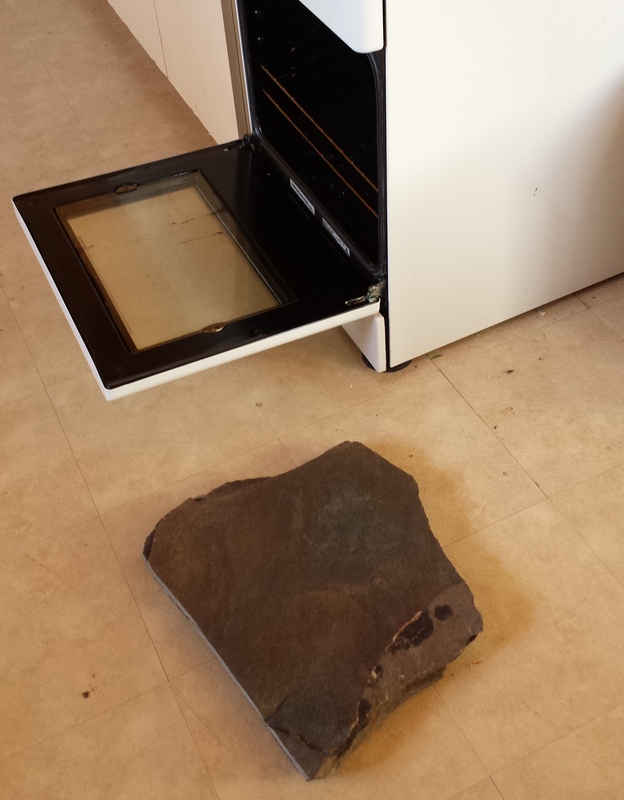 The stone almost fitted the oven perfectly, needing only a small bit of trimming to get the door shut. 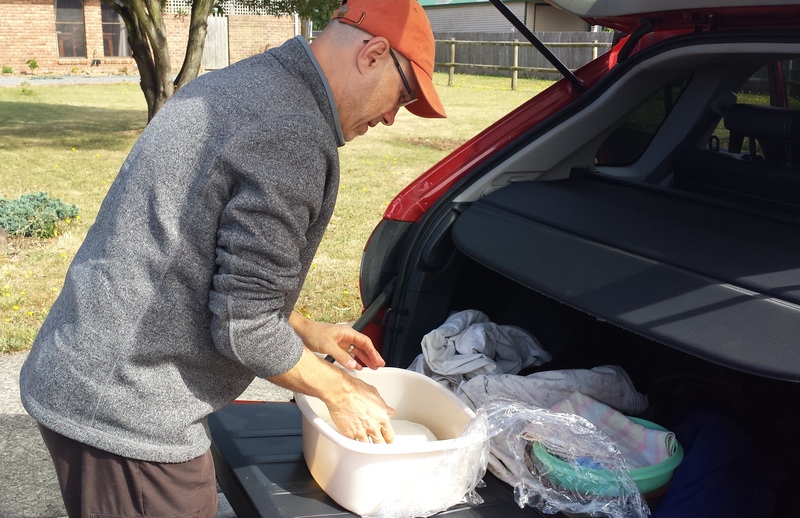 Fortunately the ever resourceful Tasmanians came to the rescue again – Don brought his angle grinder, with a diamond disk no less, and in minutes we had a perfect stone for the oven. Trimmed stone beside the oven at the Devonport Fly Fishing Club’s Lodge. We bought some Defiance bakers flour from Woolies (this is generally a strong or high protein flour). Don (also a dabbler in sourdough bread making), supplied us with his royal and ancient stoneground flour. The problem with getting good flours is that you end up having to buy a large quantity and unless you bake every day there is a good chance it will be out of date before you use it all. Well, Don’s stoneground worked fine despite being only 20% of the formula and expired in 2012! So don’t throw out the old flour unless the proportion of weevils is too high to stomach. What a surprise it was to find a set of scales at the Lodge! Not the best in the world by any stretch of the imagination, but much better than nothing. Next time we’ll remember to bring the digital scales as well as Steve. I have to admit that I was a tad apprehensive baking in a totally foreign environment – my first away from home baking. Would there be the necessary tools and appliances? Seems that when you set your mind to it you quickly discover how easy it is to adapt to the conditions – you can always find some kind of utensils that work well enough. Containers are really all the same. The only tricky elements were the scales, which weren’t really accurate (but at least consistent), and the oven, which proved fine once we got the stone. 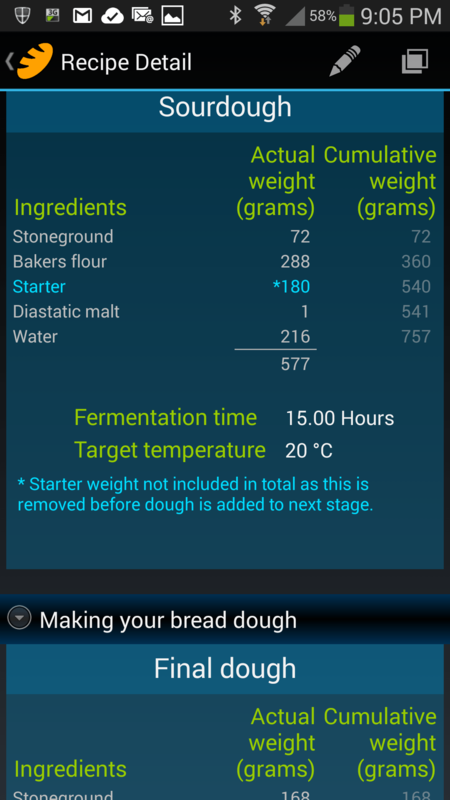 Screen shot of Android sourdough bread app lovingly called BreadBoss. Luckily, I had the use of my sourdough bread App (affectionately coined BreadBoss by my twelve year old son Lukas) to help with all the recipe calculations. It’s an Android app and is a work in progress, but proved to be perfect for the occasion. We created a 80% white and 20% stoneground flour recipe and put in the number of loaves and their required weight and the BreadBoss listed all the necessary ingredients and weights for both the sourdough and final dough. The sourdough went overnight (15 hours) and quite surprisingly for an Australian January we had to have the wood fire going strong in the evening to keep the 4°C temperatures at bay. A couple of big logs before bed and in the morning the sourdough was nicely matured. Sourdough after an unseasonably cold night at the Tasmanian highlands. Had to have the wood fire going most of the night. In making the final dough, Boris sagely advised that I should use the delayed salt method of mixing (because of the high protein flour). This meant that I didn’t add the salt to the dough until after I’d mixed it for the first few minutes and left it to rest. Then I sprinkled the salt over the dough and worked it through. It was interesting to see the effect of the salt after only a minute or two of mixing. Delaying the salt allows for easy development of the protein, as the salt tends to toughen it, making mixing a better workout. Mixing the final dough in a stainless steel pot. The salt waiting to go in once mixed and a short rest completed. The next day was a lazy one and the turning of the dough over 4 hours was not a problem as we were staying close to the Lodge. The next day we put the stone to the test and ‘fired’ up the oven. As it was quite a thick piece of stone we preheated for about 50 minutes. The bread baked beautifully and we got four nice round cobs. The slashing was a bit rough as the sharpest implement we had was a Swiss army knife, but it was adequate. Regardless of what you have available it’s worth doing the slashing, as Boris’s post Good slashing is easy when you know how! will elucidate. 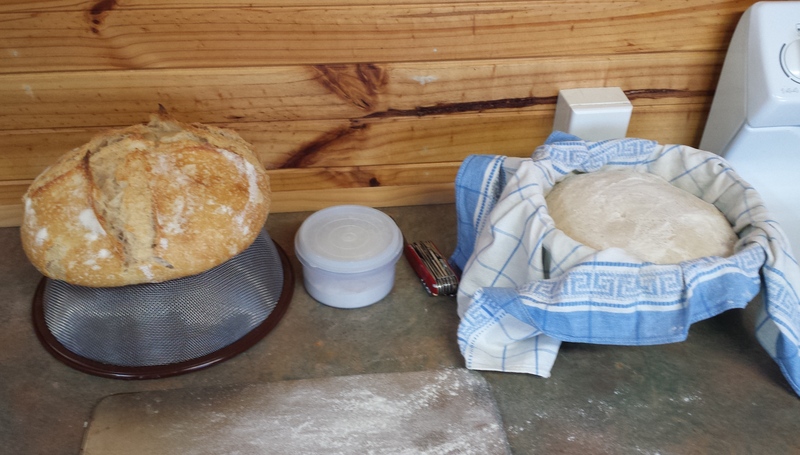 The final results of baking bread at the Devonport Fly Fishing Club’s Lodge. 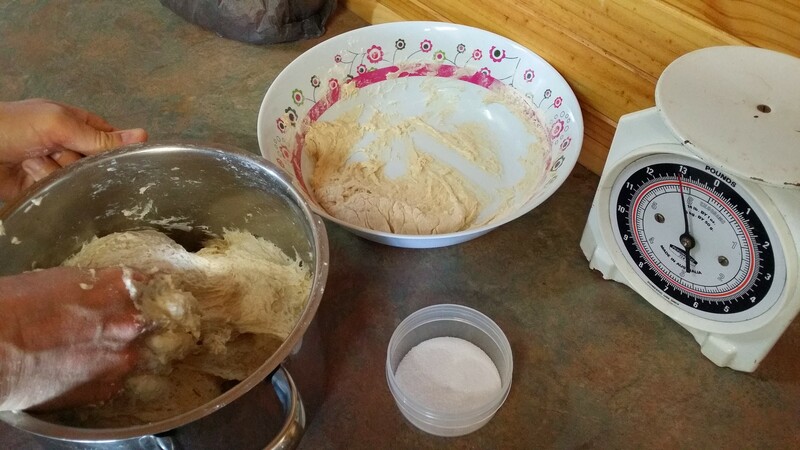 Results of baking bread at the Devonport Fly Fishing Club’s Lodge. The second batch of bread really had to be on the go. We’d already arranged to go up to Longford for the day so we took the final dough with us and stopped approximately every hour to turn it over. I was given some strange looks by passing Tasmanians, wondering what the hell I was doing. Kon turning over the bread dough. We carried it around in the back of the car for most of the day. By late morning the dough was ready to be molded so we stopped at Don’s real home (as opposed to his fishing shack where he’d been staying up till then). 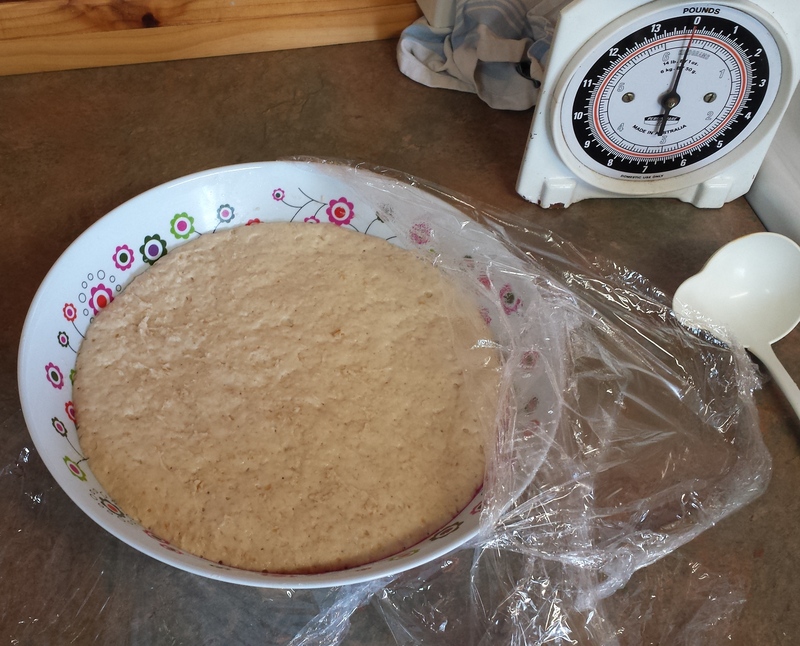 Without scales we roughly divided the dough and molded them into round loaves, placing them into tea towel lined containers (a colander and Tupperware container we’d brought with us from the Lodge). By the time we got home the dough had nicely proved in the warm back of the car and was well and truly ready for baking. One loaf baked sitting on an improvised cooling rack (colander). Shows our slashing tool (Swiss army knife), improvised peel (thin baking tray) and the next loaf to be added sitting in its improvised banneton (Tupperware container) and couche cloth (tea towel). Baked loaf on the home made stone in the oven at the Devonport Fly Fishing Club Lodge. A big thank you to Don and Murray who helped with the stone, flour and fishing. Another good result! Boris with a beautiful trout caught in the Tasmanian highlands Penstock Lake. Nice story Kon, is Don still baking? As far as I’m aware Don is back and keen. Enjoyed reading your piece! We enjoyed your bread and most importantly your friendship in the Tasmanian highlands. 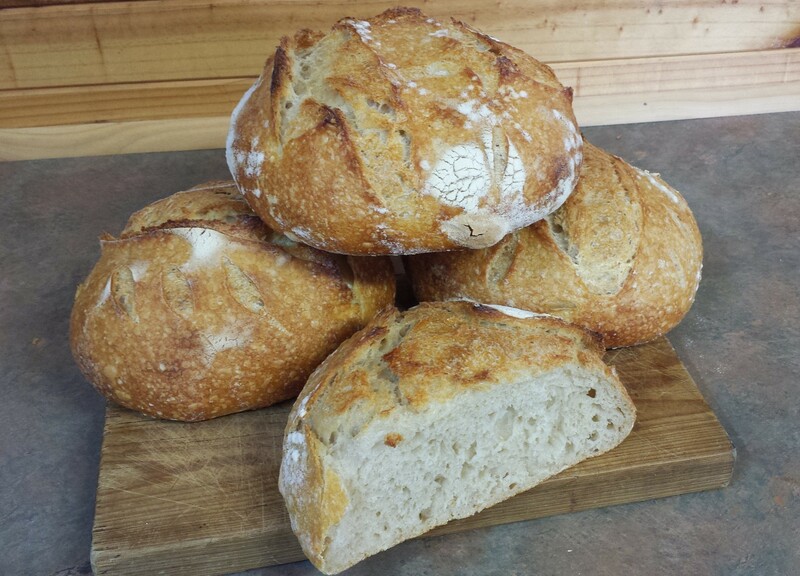 You left no “stone unturned” in baking excellent bread. I managed to eat my entire cob in one day. It was really quite easy…breakfast, lunch and dinner. Sensational! Now we must entice Don back to baking, after his fine tuning from expert tuition. 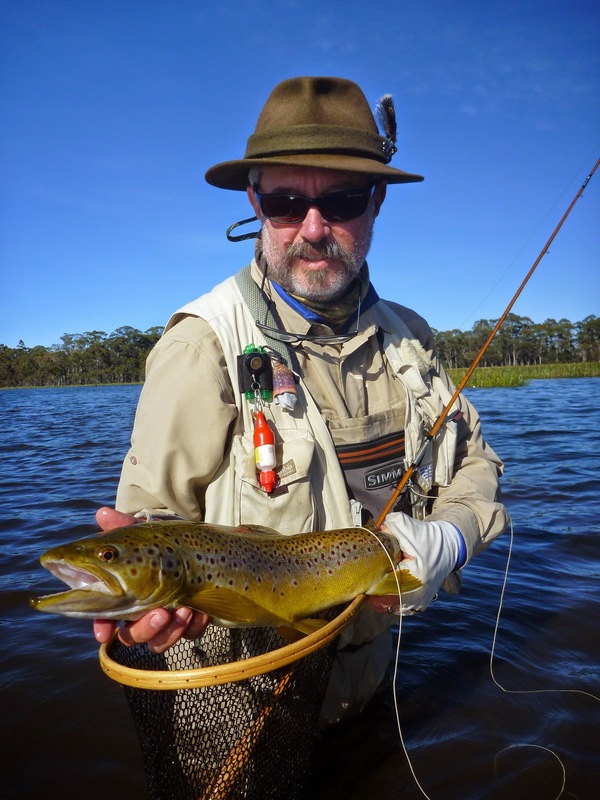 Expect to see you back in the highlands for a spot of fly fishing, trout catching, trout smoking and fine dinning. It was a great pleasure and privilege to meet such an accomplished bushman/fisherman. I hope some of it rubbed off onto Lukas. Oi! I was a software engineer. 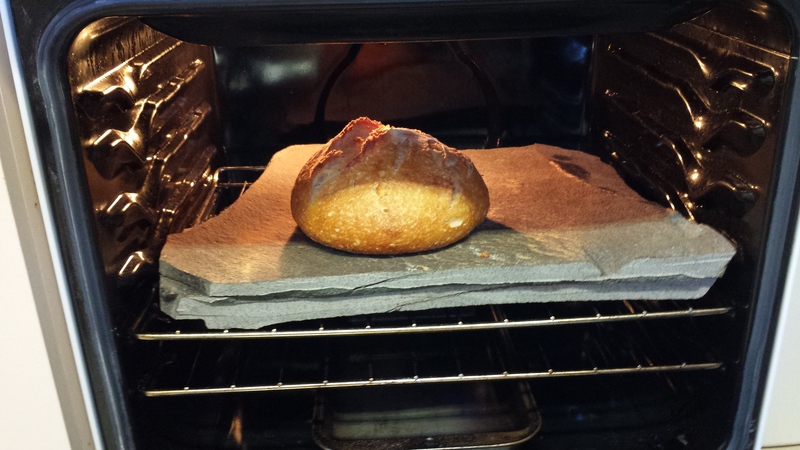 It seems to me that a surprising number of sourdough bakers are current or ex-software engineers. In fact I’m wondering if there is a reason for that. Maybe people who aren’t affraid of computers and are prepared to mess with their workings are also naturally people who aren’t scared of wild yeast and have to have something out of a packet. Fantastic looking loaves, and I bet they tasted pretty special with fresh fish. Thanks Mike. I think that the set of software engineers and sourdough bakers may be more a reflection of personality type plus opportunity, but it’s certainly nice to know I’m not alone. I’m not quite at the retirement stage of my IT career (although I’d like to be). I’m trying to mix the two passions – hence the app. As for the bread – even my worst attempts (and I’ve baked some bad stuff:) are still better/healthier than the industrial bread from supermarkets. I saw your croissants – nice going (I’m going to give it a try myself one of these days). I know this is an old post, but maybe you/someone can help anyway. I bake sourdough at home in Sydney and recently travelled to Tassie where a friend wanted me to show her how it’s done. 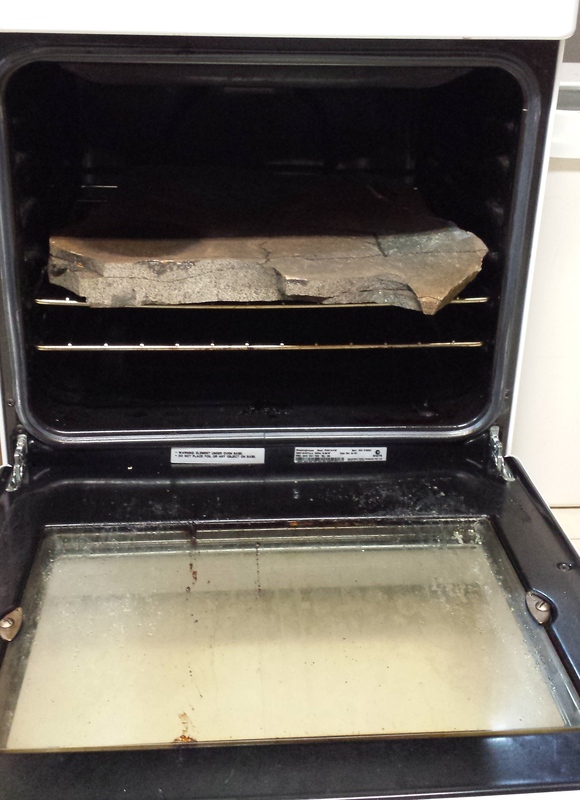 I managed to source most things, but a baking stone eluded me. Where was the one mentioned in this post from? The stone was actually sourced from the shores of Great Lake around where we were staying (at Miena). The stone that I use at home is made from a granite off cut from a kitchen renovation. I suggest you either look up a kitchen stone bench supplier who would have no trouble getting and cutting what you want – make sure it is real stone and not an artificial stone as these have resins in them and may either burn or release chemicals into the bread. The pieces that get cut out for stoves and sinks are ideal for this. Alternatively you can get pizza stones, which are usually ceramics. Not sure where you can get this – what ever I’d suggest may not apply in Tasmania. Google is your friend in this case.